12-Feb-2015 -- While on a quick (2-day) drive from Sydney north to Gold Coast, I (of course!) decided to try to visit some Degree Confluence Points en route. A quick examination of aerial photography (plus reports from previous visitors) made it clear that the two points on the 33 Degree South line - just north of Sydney - would be difficult to reach. For those points, I’ll wait until I have more time to spend in the Sydney area. On the other hand, the confluence points on the next line of latitude to the north - 32 Degrees South - looked much easier. I decided to visit the (very easy looking) 32S 152E point during my first day driving north from Sydney. The confluence point lies on a sloping farm field, just inside a small creek bed. 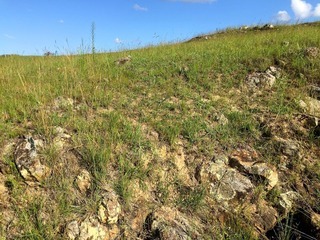 The point is at a place where some rocks have been exposed due to erosion by the creek - so unlike many other confluence points in eastern Australia, it’s not just bland pasture. After visiting the point, I continued along Bucketts Way back towards the coast. First, I stopped briefly at the Mograni Lookout, where I could look down upon the confluence point, 900 m away.